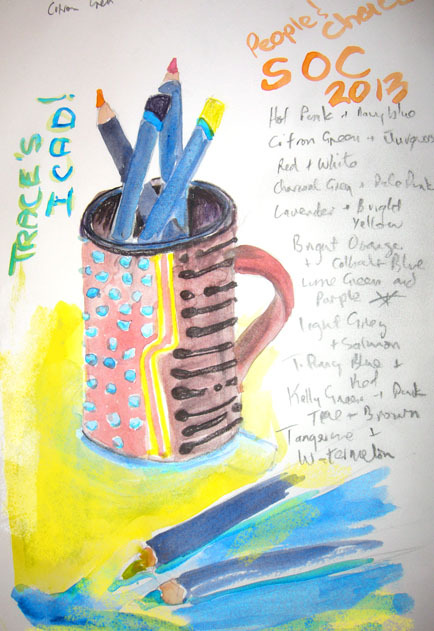 The prompt this week at The Artist’s Play Room is Mugs inspired by Tracey Fletcher Kings love of tea and attempt to do 61 mugs for this year’s ICAD (Index Card A Day). I couldn’t help myself; I have a mug I got in Australia in the 90’s when visiting my Mum in NSW. Whenever I visited I would be dragged around all the local craft workshops and stores and galleries. My Mum brought it for me hoping perhaps that I would be inspired to go and live there! But nah, I am Kiwi through and through. Note, despite her extolling the virtues of Aussie, she has kept her NZ citizenship despite living there for over 30 years! Sorry Trace, it is revolting to drink out of as the outside is rough clay and it feels horrible on your lips. However, it makes an excellent pencil holder for my inktense pencils. Also it reminds me of Mum in her better days and the interest we shared in art and crafts. You will note that I have got some text about the Summer of Colour Blog Event that Kirsten of Twinkle Twinkle like a Star (http://twinkletwinklelikeastar.blogspot.com) is convening. I am taking part in that and our job this week is to advertise it and if we do we have a change in winning a prize, hehehe! This week we vote for the colour we will use next week when we start to party for 6 weeks. There are some delicious combinations, I voted for Lime and Purple. However, I noticed that Citron Green and Turquoise is leading the stakes. Whatever, all the choices are delicious. I am not sure whether to have a theme or not, I’ll let the muse take over! If you like colour and would like to celebrate the summer or like Trace and I, you want to brighten our winter, come and join us. Oh and it is for any art medium or craft. Hooray for your wonderful tea cup!! Hooray for the summer of color event. Can't wait to join in the fun. I'll have to go make sure I'm keeping up! Oh so wonderful!! Love the cup! It has character and love the detail and colors!! Yay! Me too, visiting from APR. It's funny that every artist seems to have at least one mug of pencils on their desk, and I love the Inktense too. I can just imagine the feel of trying to drink from that mug - a real case of design over function, but I love your painting of it. And I'm looking forward to joining in with Summer of Colour next week. But I chose charcoal and pink. What a great mug but I can see how the lumps and bumps might be a little weird to drink from. I think you made the best use for the cup and your painting is wonderful. lulicious!!! most of my mugs are filled with pens, markers, and coloured pencils. but I DO have a few I love to drink from. the summer of colour looks like fun. thanks for the intro.